Preheat the oven to 375 degrees Fahrenheit. Put a rack on the lowest possible shelf in the oven. Mix apples with flour, cinnamon, nutmeg, sugar of choice, lemon juice, vanilla, and salt. Taste a few apple slices, adding more cinnamon or sugar, if necessary. Set aside while you prepare the dough. Roll out the bottom crust of your pie on a floured countertop. Transfer crust to the bottom of a pie pan, letting excess dough hang slightly over the sides. Dump prepared apples into the bottom crust, then roll out the top crust and drape it over the apples. Tuck the edges of the top crust under the edges of the bottom crust, and use your fingers or the tines of a fork to seal it tight. Use a sharp knife to poke a few holes into the top of the pie. Sprinkle with a big pinch of sugar. Bake on the lowest oven rack for 40-50 minutes, or until top crust is lightly golden brown. Allow pie to cool for at least 30 minutes, but preferably for an hour or more before slicing and serving. Pie should stay relatively crisp and fresh for 3 days at room temperature. 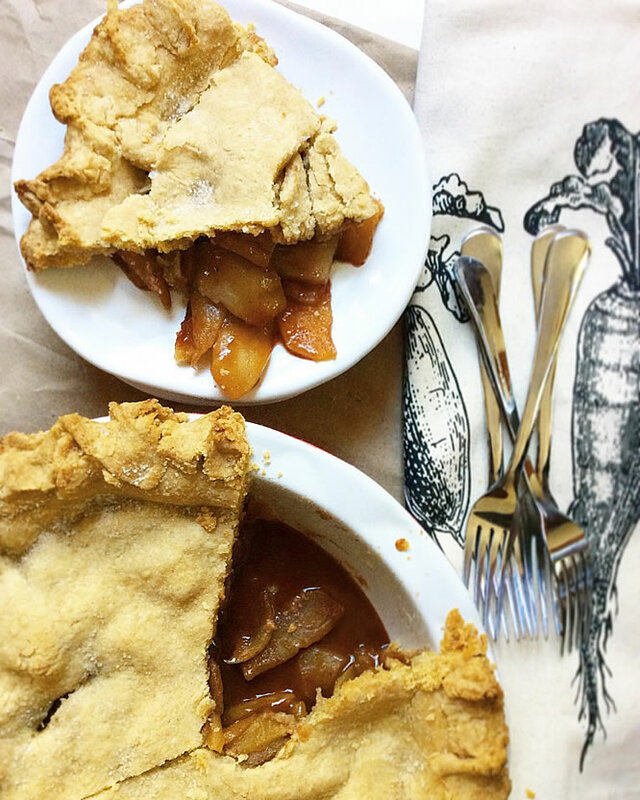 *Be sure to choose at least two different varieties of apple for your pie. **Start with 1/2 teaspoon of cinnamon, and add more to taste. ***Start with 1/3 cup of your sweetener of choice, then taste and add more as needed. Recipe by Chelsea Colbath of Baked Greens.